GPS coords 38 45' 55.8" 106 39' 15.0" by GPS. 2 main gear, memorial plaque, flowers. The wreck cause: Loss of control in cloud and in-flight breakup of the aircraft. All aboard killed. 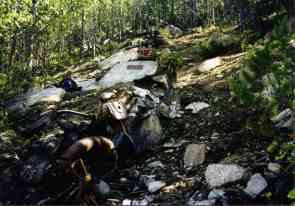 Wreckage is about 200' above the Taylor River road about 400 yards upstream from the edge of Lodgepole NFS campground. Site contains memorial placque, landing gear struts, misc. engine mount piping, some exhaust manifold piping and some melted aluminum. Appears that all other wreckage including engines was recovered by Army. Recovery would have been fairly simple to winch debris down to the road to be hauled away.Cause of crash was structural breakup in the air. Aircraft was seen to fall out of the clouds in pieces.. According to the Denver Post for 1 July 2001, Mr. Ray Rossman of the Gunnison National Forest (USDA) was involved with placing the memorial on the 50 th anniversary of the crash. Mr. Rossman's title is "Heritage Resources Manager." Best route : Wreck is located very close beside Forest Road 742, a paved road that runs down the gorge next to the Taylor River below the Taylor Reservoir Dam. Wreck is perhaps 100' above the road. About 300 yards uphill from the boundary of the Lodgepole NFS campground.